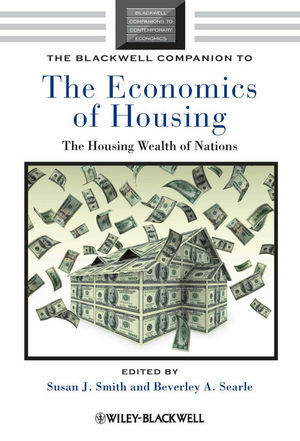 The Blackwell Companion to the Economics of Housing will help students and professionals alike to explore key elements of the housing economy: home prices, housing wealth, mortgage debt, and financial risk. Susan J. Smith is Mistress of Girton College Cambridge. She was previously Professor of Geography and a Director of the Institute of Advanced Study at Durham University. She is a graduate of Oxford University (MA, DPhil), a Fellow of the British Academy and of the Royal Society of Edinburgh, an Academician of the Academy of Social Sciences and a member of the Society of Authors. Professor Smith has published over 100 scholarly papers covering topics that range from residential segregation to health discrimination, from mortgage equity withdrawal to spread-betting on home price dynamics. Her books include Housing & Social Policy (1990), Housing for Health (2000), The Politics of Race and Residence (1989), and Children at Risk (1995). She is Editor-in-chief of the forthcoming International Encyclopedia of Housing and Home (2012) and has written a variety of press articles on home prices and housing markets. Beverley A. Searle is a Lecturer in Human Geography at Durham University. She gained a PhD in 2005 from the University of York. Her research interest focuses on housing wealth and households' welfare and well-being. She is author of Well-being: In Search of a Good Life? (2008). Chapter 1: Introduction (Susan J. Smith, Beverley A. Searle, and Gareth D. Powells). Part One: Banking on Housing. Chapter 2: Housing and Mortgage markets: An OECD perspective (Nathalie Girouard). Chapter 3: Is Housing Wealth an ‘ATM’? : International Trends (Vladimir Kluyev and Paul Mills). Chapter 4: Housing Wealth Effects and Course of the US Economy: Theory, Evidence, and Policy Implications (Eric S. Belsky). Chapter 5: The rise in house prices and household debt in the United Kingdom: potential causes and implications (Matt Waldron and Fabrizio Zampolli). Chapter 6: Housing Wealth and Mortgage Debt in Australia (Mike Berry). Chapter 7: A Survey of Housing Equity Withdrawal and Injection in Australia (Carl Schwartz, Tim Hampton, Christine Lewis and David Norman). Chapter 8: What do we know about equity withdrawal by households in New Zealand? (Mark Smith). Chapter 9: What happened to the housing system? (Duncan Maclennan). Part Two: Housing Wealth as a Financial Buffer. Chapter 10: Trading on housing wealth: political risk in an ageing society (Mike Berry and Tony Dalton). Chapter 11: Housing Equity Withdrawal and Retirement: Evidence from the Household, Income and Labour Dynamics in Australia Survey (HILDA) (Gavin Wood and Christian A. Nygaard). Chapter 12: Housing Markets, Wealth and ‘Self-Insurance’ in Spain (Joan Costa-Font, Joan Gill and Oscar Mascarilla). Chapter 13: Housing wealth: a safety net of last resort? Findings from a European study (Deborah Quilgars and Anwen Jones). Chapter 14: 'Pots of gold': Housing wealth and economic wellbeing in Australia (Val Colic-Peisker, Guy Johnson and Susan J. Smith). Chapter 15: Housing Wealth as Insurance: Insights from the UK (Beverley A Searle and Susan J Smith). Chapter 16: Housing to manage debt and family care in the USA (Helen Jarvis). Chapter 17: The Subprime State of Race (Elvin K. Wyly). Chapter 18: The Housing Finance Revolution (Richard Green and Susan Wachter). Part Three: Mitigating Housing Risk. Chapter 19: How Housing Busts End: House Prices, User Cost and Rigidities During Down Cycles (Karl E. Case and John M. Quigley). Chapter 20: Is there a Role for Shared Equity Products in Twenty-First Century Housing? Experience in Australia and the UK (Christine Whitehead, and Judith Yates). Chapter 21: Trading on house price risk: Index derivatives and home equity insurance (Peter Englund). Chapter 22: Hedging Housing Risk: A Financial Markets Perspective (Jonathan Reiss, John Blank, Peter Sceats, John Edwards with Susan J Smith). Creating housing futures: a view from the market (Jonathan Reiss). Residential property derivatives: exchange-traded futures and options (John Blank). Residential Property Derivatives: The role and relevance of over-the-counter trading (Peter Sceats). An interim Solution (John Edwards). Chapter 23: Hedging Housing Risk: Is it Feasible? (Steve Swidler and Harris Hollans). Chapter 24: Housing Risk and Property Derivatives: the Role of Financial Engineering (Juerg Syz). Chapter 25: Housing Futures: A role for derivatives? (Susan J. Smith).